“Excuse me sir, if you don’t let me use your bathroom I am going to drop my drawers right here and use your floor.” Don’t tell me that as a Crohnie that thought has never crossed your mind or (if you have the balls) those words have never come out of your mouth in a public place. We struggle with this subject more than people could even imagine. But, thankfully, those important political people are finally taking their heads out of their healthy asses and listening. Which we are very thankful for (lol). If you aren’t familiar with it, a law was passed because of a 14 year old Illinois girl in 2005 who had Crohn’s disease and had gotten turned away from using a public restroom. She had that embarrassing moment we all are much too familiar of, a potty emergency where she didn’t quite make it to the potty. I can seriously sympathize with this, it has happened to me a number of times. This law is known as Ally’s Law. It states that a person with an eligible illness gets immediate access to an establishments restroom even if it isn’t labeled for the public. Although this isn’t passed in all states, they are working on it. It just takes a little research on your state’s website to find out if your state has the law. 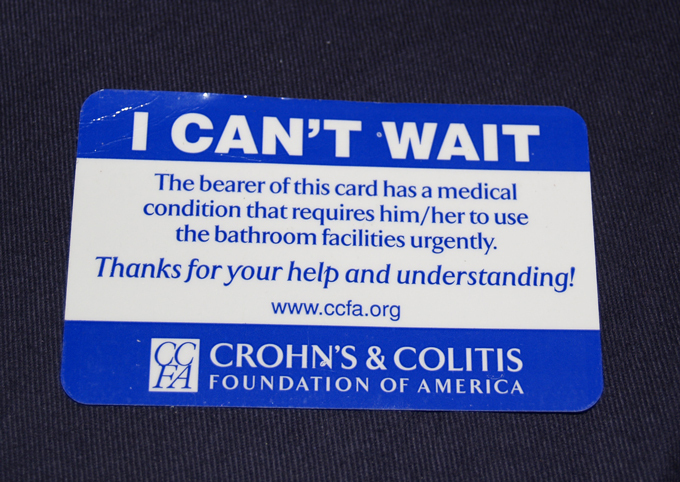 In Massachusetts (where I live) Crohn’s and UC patients should have a “bathroom access” or “I can’t wait” identification card. It makes this whole process easier. You can receive one of these pretty easily. I received mine from the CCFA, which I became a member of and they automatically mailed me one. There are a few different foundations that provide them. I do know though, mine from the CCFA has my name and identification number so I can prove it’s actually me if someone is rude enough to question it. I have used it multiple times before whether it be to cut people in line (yes, that in fact has had to happened) or just to use an employee bathroom. Being my strong stubborn self, I did get into a confrontation with a business owner once because of this. And I intend to get him in trouble. Over the years I have became much more knowledgeable about my disease and certain laws and such which has lead me to be very strong-headed about it. I was with my mom on the way to a mall by me when all of a sudden, I got the urge. As a Crohnie when you get that urge, there is NOTHING that is going to make it go away. My mom put her foot down on the pedal and got me as fast as she could to the closest store. 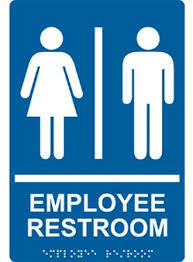 It was a convenience store with a big white sign on the front door “NO PUBLIC RESTROOMS”. “Well this is great” I thought to myself, thank god we have this law now. I scurry into the store and asked very politely if I could use the restroom, I have Crohn’s disease and I need to use it now. He said “NO.” A very firm no. My mom followed in after me and she explained to him it is illegal now to turn down a person with a medical condition from using the bathroom. He simply said he didn’t care and no matter what I wasn’t using his bathroom. I was appalled. First of all how someone could be so rude. And panic set in. If anyone wants to talk about “anxiety” which on a side note, I don’t mean to offend people but people need to really reevaluate their “anxiety” and all the meds they take for it, its absurd coming from a person who could easily be on all the anxiety medicine in the world just for the pure fact I have to deal with this disease every day of my life, there are other healthier ways to deal with it. But anyways… my “anxiety” went through the roof and I ran next door to the pizza shop which also had a big white ‘NO PUBLIC RESTROOM” sign, but thankfully I could see the bathrooms so didn’t even ask I just ran! That potty emergency ended up working out, but others haven’t gone that way… If you know what I mean.